The New Hampshire Association of Student Financial Aid Administrators (NHASFAA) represents an organization consisting of professionals engaged in the administration of student financial aid at New Hampshire institutions of higher education and businesses/community organizations that provide financial assistance programs, services, and/or support to post-secondary students. Our Mission: The New Hampshire Association of Student Financial Aid Administrators engages, educates, and empowers New Hampshire's financial aid professionals to encourage student access to, and completion of, post-secondary education. Our Vision: Developing New Hampshire financial aid professionals to promote student access and success in post-secondary education. Our Commitment to Diversity: In support of our mission, NHASFAA promotes diversity and inclusion regardless of race, ethnicity, religion, gender, age, sexual orientation, disability, appearance, geographic location, professional level or institution type. It is an honor to welcome you to the New Hampshire of Association of Student Financial Aid Administrators (NHASFAA) website---a place where I hope that you will be able to connect and network with colleagues, find meaningful and useful information, and refer to frequently as a resource that supports your role as a financial aid professional. 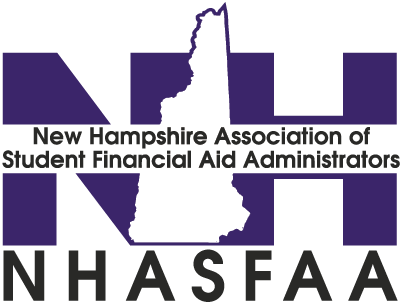 NHASFAA is the go-to network for financial aid professionals in New Hampshire. Our Association is run by an all-volunteer Council, comprised of a very active group of financial aid administrators and colleagues committed to helping students achieve the dream of a college education. A 501(c)(3) organization, NHASFAA’s history dates back to the late 1960’s, James Reynolds having served as the Association’s first President, with official By-Laws of the Association having been adopted in 1978. Our Association celebrated its 10th annual NHASFAA conference in 2016 and continues to be a staple in the New Hampshire financial aid and higher education communities. I want you to be involved! Please consider serving on one of our committees, writing for our newsletter, moderating a session at our conference, attending one of our networking events, or offering a helping hand when it comes to running our all-volunteer Association. If you have ideas, suggestions or comments, I want to hear from you! Please call or email me. It is an honor to serve and to lead this terrific association. Thank you for visiting our website---and welcome to NHASFAA!